The Maws is home to two black rescue cats. Nero arrived first in December 2013. He had spent the first 5 months of his life in Shrewsbury in the kitten unit at Shropshire Cat Rescue. Sabine had gone to Shropshire Cat Rescue to adopt a cat or kitten as she felt it was time she had a cat in her life again. Nero, or Charlie's Kitten No 3 as he was then called, had been overlooked numerous times - Cat Rescue manager Marion explained that people prefer tabbies, torties, ginger and other more colourful kittens and cats and black cats always get picked last or get left behind. He looked a gorgeous and really friendly little cat and it was love at first sight for Sabine. Within half hour, the adoption formalities were completed and kitten No 3 was on his way home with Sabine. Whilst driving along Sabine spotted a black Fiat 500 on the road - in Italian that would be a Fiat cinquecento nero - and hey, presto Kitten No 3 had a name! In July 2015 Sabine was told about a cat at in urgent need of a home. He had been knocked down by a car, lost an eye in the accident and his jaw was broken in several places. He had also lost the sight in his remaining eye. The vets had done all they could to stitch him back together- he now needed a home to recuperate in but sadly his owners did not claim him. Sabine found out that he was no longer a kitten but still was only about 18 months old, and that he was black - if people don't choose black, cute kittens like Nero who would want a black, blind, one-eyed adult cat with a wired together broken jaw? After initial ideas of getting Shropshire Cat Rescue involved Sabine thought "why not cut out the middleman?" and took on the nursing of the poorly cat, soon dubbed "The Patient". The spare bedroom was turned into the Cat Ward where The Patient could receive lots of TLC. 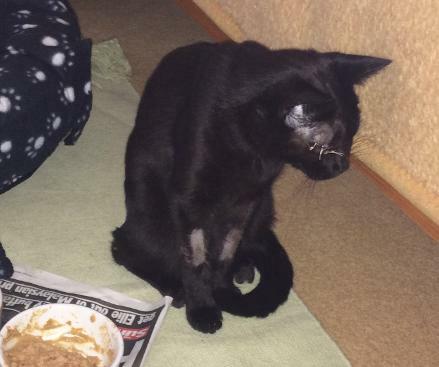 He needed hand feeding, grooming and medicating with antibiotics and pain relief. He gradually got better and better and although the prognosis for his remaining eye had not been good, miraculously the sight came back! Sabine called The Patient Laszlo after the title character Count Laszlo in the film "The English Patient". 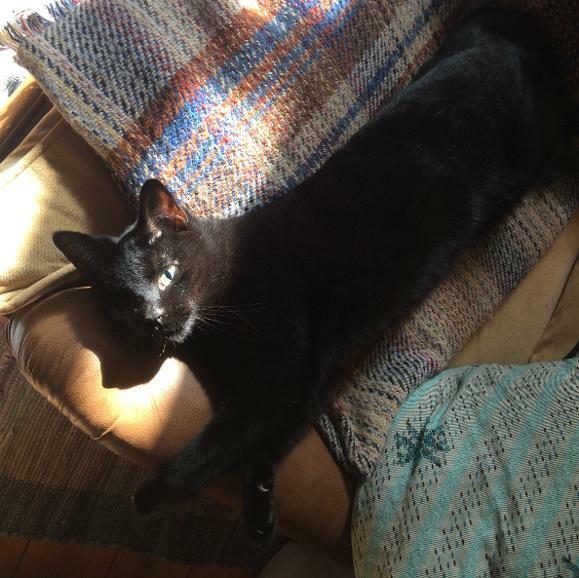 Within a few months Laszlo turned into a sleek, gorgeous house panther. He can jump almost as well as any two-eyed cat, although he is still cautious with anything too high. He even catches mice now! In fact, he's such a good mouser that between him and Nero it's a mircale that there any mice left in Jackfield. To begin Nero was not impressed with the new arrival - being blind Laszlo was aggressive trying to dfend himself and started hissing and spitting as soon as he sensed Nero entering the house. When his sight came back he became friendly and playful but by then Nero was sulking. It took a while for Nero to warm to the intruder....Now they get on quite well. They still have little fisticuffs from time to time but mostly they seem fine. They will share the bed for snoozies, engage in synchronized munching, enjoy catnip sessions and they both prefer drinking water from a glass!